Patients with articular cartilage damage experience symptoms such as joint pain, swelling, stiffness, and a decrease in range of motion of the knee. Damaged cartilage needs to be replaced with healthy cartilage and the procedure is known as cartilage replacement. It is a surgical procedure performed to replace the worn out cartilage and is usually performed to treat patients with small areas of cartilage damage usually caused by sports or traumatic injuries. It is not indicated for those patients who have advanced arthritis of the knee. 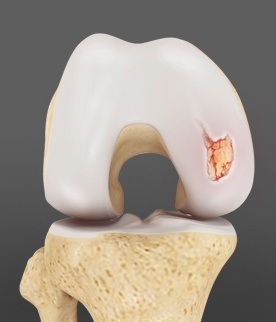 Microfracture: In this method numerous holes are created in the injured joint surface using a sharp tool. This procedure stimulates healing response by creating new blood supply. Blood supply results in growth of new fibrocartilage. Drilling: In this method a drilling instrument is used to create holes in the injured joint surface. Drilling holes creates blood supply and stimulate growth of new fibrocartilage. Although the method is similar to microfracture, it is less precise and the heat produced during drilling may damage other tissues.